The statement of the Rambam is well-known: every individual should consider that the fate of the world is in his hands. By performing a single mitzvah, one person can tilt the scales of judgement and bring salvation to the entire world. Those who learn the Sichos are already familiar with this Rambam (the Rebbe showed an enthusiasm for this Rambam over the years). But, in general, the Rebbe adds a new dimension in his use of sources, and especially regarding the Sichos of Nun-Alef/Nun-Beis we should be on the lookout for new dimensions of understanding. 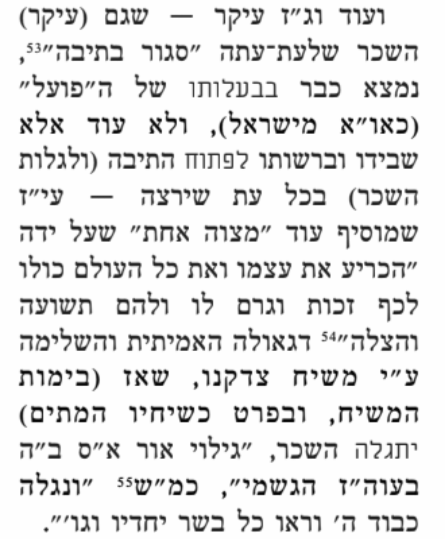 The Rebbe here separates the words “one mitzvah” מצוה אחת from the rest of the quote from the Rambam, and the Rebbe adds the words “by adding one more mitzvah” (עי”ז שמוסיף עוד מצוה אחת). To say “adding one more mitzvah” (עי”ז שמוסיף עוד מצוה אחת) implies something quite different than the Rambam’s wording of “performing one mitzvah” (עשה מצוה אחת). Adding one more (עוד) implies a mitzvah that was not already fulfilled, that there is “one more mitzvah” that we can “add” which will bring the revelations of the true and complete Geulah. This is the mitzvah mentioned in last week’s parsha, Parshas Shoftim: the mitzvah to appoint a King שום תשים עליך מלך. Although it was fulfilled in earlier generations, our generation has not properly fulfilled it. More than that, the shleimos of this mitzvah was not reached through the appointing of Shaul Hamelech or Dovid Hamelech; rather its shleimos is the appointing of Melech haMoshiach — which is the responsibility of our generation, specifically! This interpretation fits perfectly with what the Rebbe says here: because the opening of the “chest” that contains the reward of our Mitzvos (the revelation of Ohr Ein Sof in the world, as explained in the Sicha) is related to Yemos haMoshiach, and it is self-understood that in order for it to be Yemos haMoshiach there must be a Moshiach, whom the Jewish nation has a mitzvah to appoint over themselves, accepting his kingship. So look at this portion of the Sicha again, and see how the Rebbe is saying that the “one mitzvah” which we can add, which will bring the lofty revelations we are longing for, is the mitzvah of appointing a King מינוי מלך! Of course, this is a Mitzvah that falls on the shoulders of the entire Jewish nation as a whole, so it’s not enough that you and I and the bochurim in 770 accept the Rebbe as King, Melech haMoshiach, but requires the acceptance of his kingship by the Jewish nation. This is, lechoira, also the meaning of the Rebbe’s words in Noach 5752: the Geulah doesn’t depend on anything besides Moshiach himself. All that remains is to appoint the King! Two parshas are read this Shabbos: Ki Seitze (“when you go out to war on your enemy”) in the morning, and in the afternoon the first section of “Ki Savo” (“when you will enter the land to inherit it and to settle it…”). Thus, on one single Shabbos, we have two seemingly opposite lessons from the Torah: going to war against an enemy (the avodah of golus), and settling the land (the reward of the Messianic Era). Since everything is guided by Divine Providence, we have to learn from this combination: that we can be a situation of doing the avodah of making a war on the enemy in the time of golus and yet at the same time be in a completely “settled” state, which is the reward for this avodah. Through the knowledge that in essence a Jew is completely above the existence of any opposition — Hashem “consulted” with the souls of the Jewish people before creating the world, showing that we are in fact one with Hashem and above the world. If so, then why would we agree to the creation of a world that contains “enemies” whom we will have to overcome in war? Because Hashem did not want to give us “bread of shame” (unearned reward), and therefore He created a world for us to earn the reward. And our neshomos agreed. In order to realize Hashem’s desire for a dwelling place in the lower realms, there must be lower realms where there is the possibility of war. But the truth of the matter is: a Jew in his source, and even as he is enclothed in a physical body in this world — remains higher than the concept of any opposition. When a Jew is aware that this is the true reality, then even his “going out to war against the enemy” is infused with the aspect of “settling the land”. “Settling the land” implies Eretz Yisroel, a land which “desired (רצתה) to do perform the will of her Creator” — where there is no longer a “war” to fulfill Torah and Mitzvos, but rather one overcomes his evil inclination with ease. This includes all that a Jew needs in order to do the avodah itself, and after that as a reward for the avodah that he performs. And this material (and spiritual) reward is a sampling of the physical reward that will be in the Messianic Era. Not only that, but the Rebbe makes a revolutionary statement, that the verse “then their mouths will be filled with laughter” (explained by Chazal and Chassidic Discourses as referring to the Time to Come) is applicable now! “Then” is “now” in the present tense. The rewards of the Time to Come, the Messianic Age, are available to us now. Although they are “locked in a box”, every Jew can open the box whenever he wants. How? By performing one more mitzvah. As the saying goes “the future is now” — but by the Rebbe this is not merely a slogan, it is the reality! While explaining this may be a divergence from the main body of the sicha, it is important to note what the Midrash is telling us: that there will come a time following the initial revelation of Moshiach (“Moshiach is revealed in him” means the revelation of the soul of Moshiach in the one who has been anointed by Hashem to be Moshiach, explained here) when nonetheless the Jewish people will not be prepared to believe him when he says that indeed the time of their redemption has arrived. How do they get out of their own lack of confidence in themselves and in the words of Moshiach? The Midrash says “see via my light” (ראו באורי שזרח עליכם), that through Moshiach’s light, meaning wisdom — the Torah that Moshiach teaches–they will be able to see the reality that Moshiach is describing to them. Through our effort to learn and understand the Torah that Moshiach is revealing to us, we will merit to see the reality that he is describing to us: the reality that “the time of your redemption has arrived”!